With the Expo and Gold line extensions open for business, we need a new rail project to breathlessly watch come together. The Purple Line extension and Regional Connector are both subways, so it’s hard to see much of the work going on. 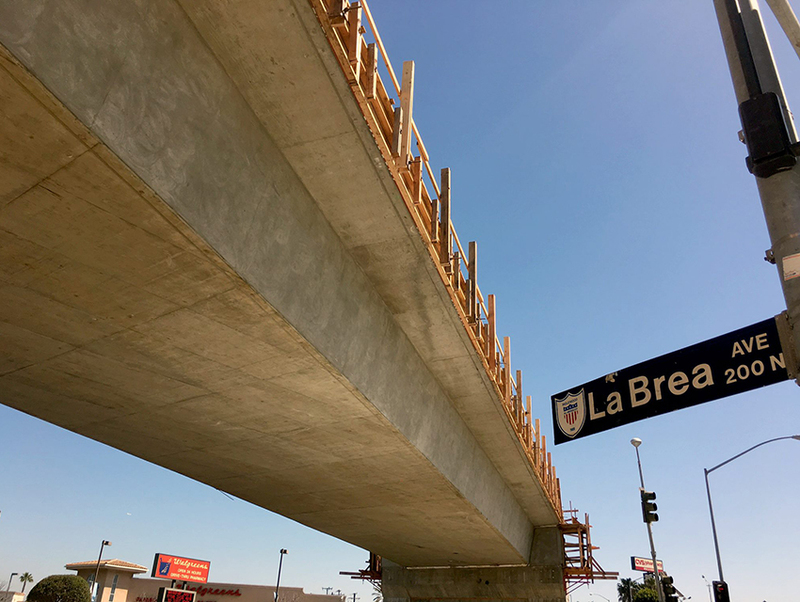 Thankfully, the Crenshaw Line—which will finally provide a rail link to LAX—is being built partially above ground (a good chunk is underground, too) and concurrently with the aforementioned projects. Metro is working hard to open the line on time in 2019 (they tell us they’re on track) and the line is now starting to come to focus. 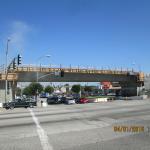 Six bridges are part of the project, spanning iconic routes like the 405 and La Brea Avenue. 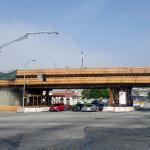 The La Brea bridge—about a quarter mile west of the forthcoming Downtown Inglewood station and two blocks from Inglewood City Hall—is the first aerial structure to near completion; it’s currently 90 percent finished (these pics, the most recent, are from a few months ago). The bridge is 128 feet long, 32 feet wide, and has 18 feet of vertical/pedestrian clearance underneath. “It’s a sign of progress,” Kim Upton, Metro’s Senior Public Communications Officer, tells us. 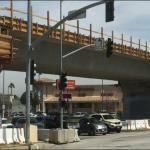 The 405 bridge will be an even bigger endeavor than the La Brea span. 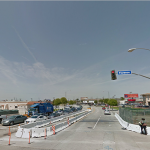 “The I-405 structure is significant because it’s very long—approximately 800 feet—and crosses Hyde Park Av, Interstate 405, La Cienega Bl and goes over an old rail bridge over Interstate 405 parallel to Florence Avenue,” Upton tells us. The construction team is also working hard to connect the Crenshaw Line to the Green Line, to ensure both rail routes have access to LAX.